Hawthorns (Crataegus spp.) are large shrubs or small trees that usually grow in thickets in the wild. In the home garden, their yellow or red fruits add seasonal color in the fall and winter, as well as provide food for birds and wildlife. In addition, small animals often nest in the dense, thorny foliage. Depending on the variety, hawthorns can grow in United States Department of Agriculture plant hardiness zones 3a through 11a. The fungus entosporium causes tiny reddish spots on the older leaves of hawthorns. Some of the spots may have halos. As the disease progress, the spots get bigger, turn darker red, and develop spores. In some cases, a glossy membrane may form over the spores. Diseased leaves fall from the tree prematurely. Spray a mixture of 2 1/4 teaspoons of chlorothalonil in 1 gallon of water to the upper and lower sides of the leaves until the liquid runs off. Apply every seven to 14 days until the symptoms are gone. During wet or cloudy weather, apply the spray at the recommended shorter intervals. Fire blight is a bacterial disease that causes the infected plant material of hawthorns to turn brown or black and appear scorched. Once the pathogen enters a flower, it can spread to the stems, leaves and fruit. In severe cases, the disease spreads to the roots of the tree and can kill it. Infected flowers and shoots wilt, and the ends of the shoots curve into the shape of a hook. Pink to orangish-red streaks form under the bark of infected wood, and small cankers appear on the branches and trunk. Apply a mixture of 1/2 to 1 teaspoon liquid copper fungicide in 1 gallon of water every five to seven days from the beginning of the bloom cycle until flowering stops. Cedar-hawthorn rust is a fungal disease that causes deformed fruit and orangish-red spots on the leaves of hawthorns. Cedar-quince rust also causes orangish-red spots on the leaves, as well as distorted growth of infected petioles, twigs, and thorns. Severe cases of both types of rust cause the premature drop of foliage. Apply chlorothalonil at the same rate as for entosporium leaf spots mentioned previously. 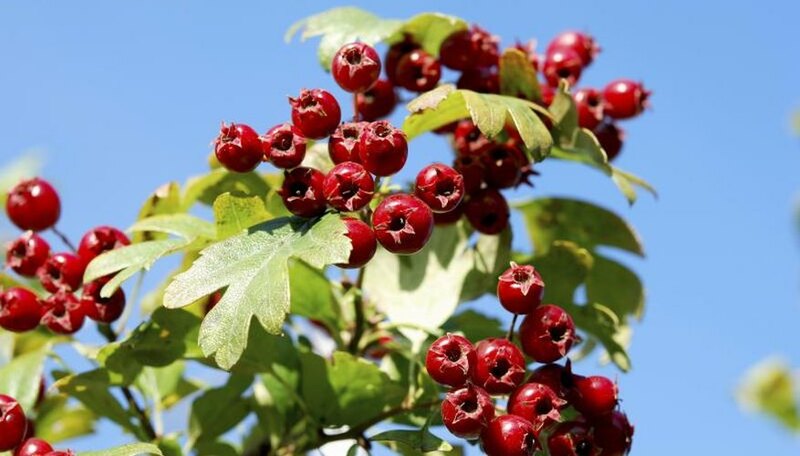 A hawthorn grows 15 to 25 feet wide, depending on the species, and should be planted at least half of its estimated mature size from other trees to allow good air circulation. Thinning out crowded branches also improves air circulation. Do not use overhead irrigation, or water during the morning so the foliage has time to dry before evening. In addition, do not water hawthorns while they are blooming to help prevent fire blight. Excessive amounts of nitrogen fertilizer and heavy pruning promote succulent new growth that is more susceptible to diseases. Remove and destroy infected plant material. After pruning diseased plants, disinfect pruners with Lysol cleaner, bleach or alcohol. Wear long sleeves, long pants, socks, shoes, and gloves when applying chemicals. Wash exposed skin immediately afterwards. Do not spray chemicals on windy days and do not allow the spray to drift onto other plants. Do not contaminate bodies of water with spray or rinse water. Keep people and pets out of treated areas until the spray is completely dry.